Also save the date... I'll be teaching Manifesting in the Flow of Grace in Sedona, October 6, 2018 and God-willing live streaming it as well for those of you who can't travel! Meanwhile I'm teaching Dancing with Angels in Sedona on May 19 this year! No live streaming for that one but I do have it on video and CD if you can't come play with us! Focus and feeling = Fun! Photo taken in Phoenix, AZ • ©Ann Albers, All rights Reserved. I teach the principles the angels talk about, and I’ve been blow away by what students create. One of our “Ann & the Angels,” viewers reduced her student loan debt from $90K to "nearly gone" in less than a year. Another got her song on a national TV show and recreated herself as a public speaker! Intentional “focus with feeling” equals a lot of fun! I challenge myself constantly to practice what I preach. If I have a pain and catch myself whining, I sit, breathe, and imagine feeling wonderful. My body starts to heal. If I have a financial issue or a home repair, I sit, breathe, and focus on what it would feel like to have no financial concerns whatsoever. I have received so many miraculous gifts from the universe that I know, when I don’t know how to handle something, God does. Sometimes I am the angel for others. Bless those of you who have been the angels for me! You know who you are! The other day I caught myself missing one of two dear clients who had died over the holidays. I started to cry with feelings of loss, but then caught myself. There’s nothing wrong with grief, but I know I don't have to be sad, so I immediately began to focus on our loving connection. Sure enough she showed up in my mind with a warmth that had me both laughing and crying – this time for the sheer delight of feeling her love and joy! For awhile I felt pretty confident with my manifesting. Then I saw the latest Star Wars! Once again a desire arose in me – one that pops up every time I see a Star Wars movie! (I know many of you secretly want to be a Jedi too!) I really want to learn telekinesis - the ability to move things with my mind. Why not? Kids are doing that and so many more amazing things these days. They don’t have any unconscious beliefs blocking it. So, I started googling, watching YouTube videos and reading everything I could find on the subject. I bought some online tutorials and began my practice! Late at night, before bed, I dutifully folded up a piece of foil, and stood it on edge. I blew on it to make sure my breath wouldn't knock it over. I turned off the heater and shut the doors to make sure there were no drafts. I began to drop into that space of "all heart and no mind." Nothing. I continued to surrender, attempting to find that feeling where the foil and Ann were part of one big field. After awhile of simply sitting in no-minded surrender, I dropped into the Oneness. I felt the awareness of my "Ann-self" expand into the awareness of a greater Self. A childlike delight arose within Ann - staring at the foil! That was “me” too! I felt wonder, immense love, and a sense of being that Divine field of love encompassing all things - Ann & the foil included. I no longer cared about moving anything. I was swimming in an ocean of bliss. Suddenly I imagined the foil moving. Suddenly, without any sort of effort whatsoever, the foil began to jiggle and dance on the desk! Immediately. I zapped back into a very freaked-out Ann-brain! Oooh! I thought I believed in these abilities, but the minute I saw it, I saw my own unconscious disbeliefs just as clearly! I got back into that space again a few more times. The foil danced a few more times, and each time I came ripping right out of that space, deeply aware of my own doubts! It was like being two people - the faith filled one and the skeptic, sharing one brain, arguing in one body! The next night as I merged with the foil, I had a feeling as if it was my finger. I flicked it with my mind and it fell over! And then my brain jumped in and started to censor the entire experience completely, and I haven’t been able to do it ever since!! The experience is a great teaching tool that demonstrates why we can “believe” we’re manifesting something but have lurking unconscious beliefs – ones we don’t even know about – that block it! My conscious mind believes I can move things. Obviously my unconscious mind is not fully on board yet! When your unconscious mind fully believes something – at a level far beneath your thoughts – then you can manifest like crazy. 1. Ask yourself "What would it feel like to have what I want?" The conscious mind believes in thoughts. The unconscious mind believes in feelings. Your unconscious mind was programmed by hearing things charged with feeling at various stages in your life. It reacts before you even have time to think. It is what causes you to deflect a ball thrown at you before it hits you. You don't have time to think, "Oh there is a ball coming at me. I better put up my hand and deflect it!" Your unconscious mind is programmed to do this. Likewise, you don't think about how to drive a car. You excitedly filed that information years ago. Similarly maybe you consciously can think about and decide you want money or a great relationship but something in you that learned with a lot of feeling, maybe even years ago is unconsciously saying, "That won't happen!" It takes focusing on a feeling to reprogram the unconscious mind. Spend a little time every day imagining what it would feel like to have your dreams. Imagine they're already here. What is your day like? What do you feel? You are now reprogramming! 2. Seek out examples of people who have what you want and be happy for them! If they can have the dream, so can you. You may consciously believe you can have what you want, but the unconscious hasn't seen it and doesn't believe it yet. Seek out examples, role models, mentors, or icons who help prove to your unconscious that just because you haven't had an experience doesn't mean it is impossible. Be happy for those who have what you want - you are programming your unconscious to rejoice in having what you want! I am watching kids on YouTube who have embraced their God given "superpowers." They delight me! I don't waste time thinking, "Oh gosh what's wrong with me that I can't do what a kid can," instead I celebrate their demonstration of our greater human potential. There are many healing therapies and modalities that help you reprogram the unconscious mind. Hypnotherapy is a powerful one. EFT is another. EMDR. There are many more. Give yourself the gift of a reprogramming session to help you shift those brain circuits that may be running contrary to your desires. Have fun this week. Think of something you wish to change. How would it feel if you were already there? Get juicy. Imagine the feeling until you feel it in your body and your bones. Or choose one of the other techniques above. Give yourself the gift of retraining the parts of your brain that hold you back! I'll keep at it myself and let you know how it goes! 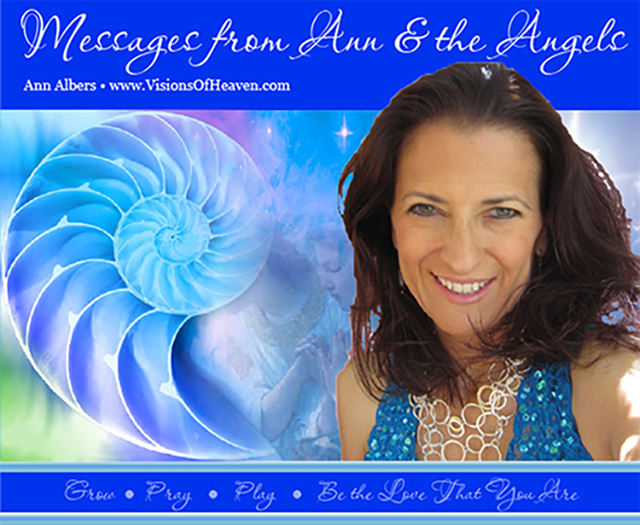 Watch Ann & the Angels on Internet TV! Watch Anytime, Anywhere, with Anyone! For our friends in New Zealand, this is Mon, Aug 14th at 6am, 7am, 8am, 10am, 11am, noon, and 1pm. All others, please use the time zone converter here – Plug in the PT time using Los Angeles, CA then your zone. If you need one with more accessibility, try this one! Please note: You can watch even if you don't have a Facebook account. It will ask you to create a login, but you can select "Not Now" & scroll past the message to watch the gaze. You may have to refresh your browser. A Spa Day for the Soul in Beautiful Sedona, AZ! Enjoy Ann's Books, CDs, MP3s & More! Love Yourself • Talk to Angels • Uplift Your Soul • & More! other spices depending on your tastes: Italian seasoning, dill, cumin and coriander, curry, you name it! I used frozen chicken breasts. If you use thawed, decrease pressurized cooking time to 4 minutes. Dump the broth, water, lemons, and garlic into the pressure cooker. Put in the trivet or steamer basket. Put the chicken breasts and add a sprinkle of salt and pepper. Set steam valve to "sealing" or closed and choose a manual pressure cook of 10-12 minutes if the meat is frozen (12 if hard frozen), 4 if not. Let it run. When the thing beeps to say it is done (Takes about 10 minutes to come to pressure, about ten more to cook), allow steam to release naturally for 10 minutes and then quick release. Eat, enjoy! Put everything in the pot. Turn on high for 6 hours if cooking frozen chicken breasts. Turn on high for 3 hrs if cooking thawed chicken breasts. Unless otherwise stated, Recipes are ©Ann Albers, all rights reserved. If you want to reprint Ann's recipes, please include "©Ann Albers, www.visionsofheaven.com"
Ann's Books, Meditations, Classes, MP3s, photos, & More! VISIT NOW. ©2016 Ann Albers, All Rights Reserved.